The Doctor Who Christmas Special: It’s for adults too! The Doctor is back! And Santa is a action hero, sort of. 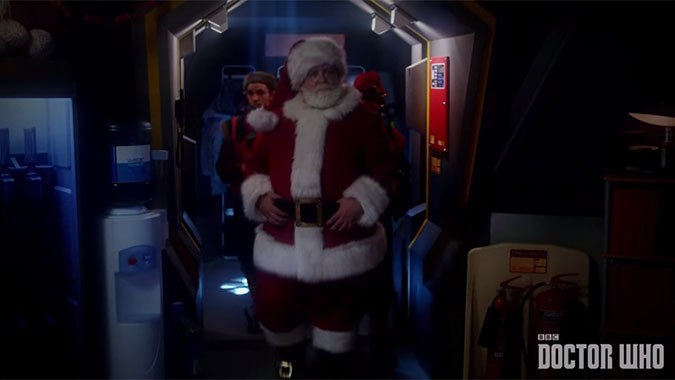 As evidenced by this year’s Christmas Special, Doctor Who has always effectively stood on the border between childish and entertaining enough for adults. The disgusting brain eating aliens that latch onto your face are probably not entirely kid friendly, while the “if you believe in Santa you will not die gruesomely at the hands of an alien invasion” is enough to satisfy your children’s fantasies for another year. It’s a strange program in that way – sentimental but action packed, creepy but grounded enough in fantasy that would feel sappy if it wasn’t for the over all dark tone of the show. It’s good at keeping the audience’s childhood wonder at the world intact, that feeling of warmth and security in knowing that fairy tales are real. The Doctor is his own kind of fairy tale, for those inclined toward the science-fiction world anyway, and goodness knows I have slept soundly on many nights, comforted by the fact that, even if it’s just on my TV screen, there’s an alien in the shape of a human somewhere out there, fighting to keep some good in the universe. Half way through – spoiler – we find out that Santa isn’t real though, which I thought was smart. Sure, there was that moment that I had to turn away from, in which our company holds hands and fills their hearts with the spirit of Christmas – a bit much if you ask me, if that’s not too Grinch-like of a sentiment to express amongst friends – but there’s only room for one fairy tale character on the BBC, and so Santa cedes to the Doctor, whom the audience knows, is very, very real. So it was an entertaining episode, nothing to get to excited over. It did put me in the mood for the new series, and that intimate moment where Clara and the Doctor both admit their respective lies, told in service of the others’ happiness, was simply and powerfully rendered, a quick but necessary testament to their friendship, made me at least a little more charitable to Clara, who I always found to be a poor replacement for the fiery Amy Pond. Perhaps in the new year Clara will find her reason sparkle – and Moffat willing, it will not be the result of meeting a new man. Until then! ← Let’s All Speculate Wildly About Sleepy Hollow! I haven’t watched it yet….have it DVRd….I will comment in a day or two!!! That was a great sci-fi story! Doctor Who has some that are great and some that are a bit…off. But I think that story….was just a joy. I love the concept of dream as reality. And reality as dream. I think they did a good job with this one!